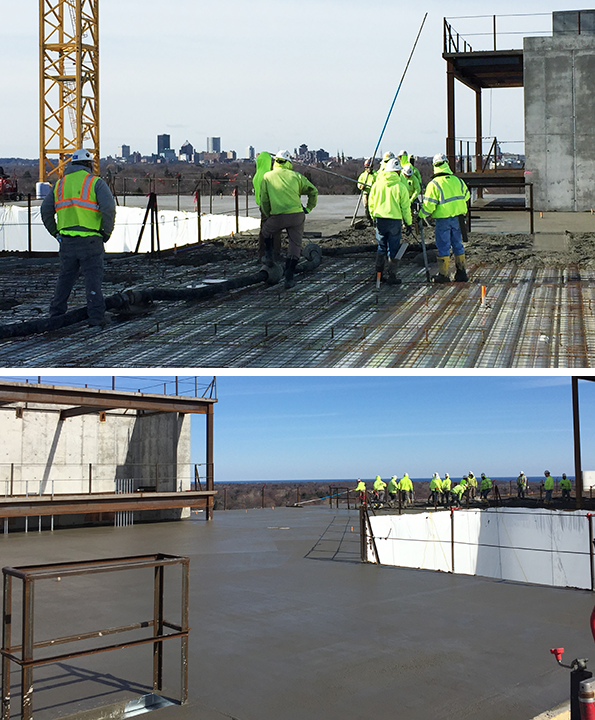 By Jeanne Eason April 5, 2019 Project Highlights, Rochester, N.Y.
With a view of the Rochester skyline in the distance, crews completed the first concrete pour for the roof above the 9th floor of the Sands-Constellation Center for Critical Care. LeChase is CM-at-Risk for the Center, which is being built at Rochester General Hospital. About 225 cubic yards of concrete was used in this pour, the first of two needed for the roof. Overall, about 4,100 cubic yards have been poured for the project so far, with about 1,800 cubic yards more to come.